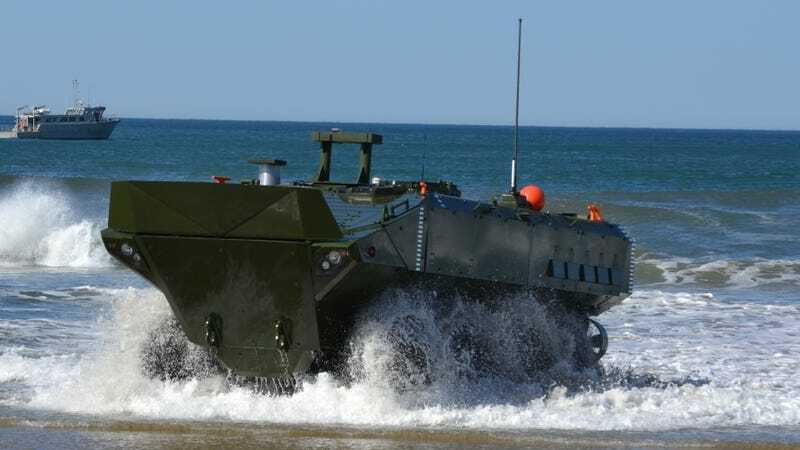 Is The Marines&#39; Amphibious Combat Vehicle What The Service Needs? The Amphibious Combat Vehicle, or ACV. The new vehicles, designed and built by BAE Systems, are 8x8 wheeled armored personnel carriers. Each ACV is capable of carrying up to squad of 13 fully-equipped Marines and a crew of three up to 365 miles on land before refueling. The vehicle weighs 30 tons and has a 690 horsepower engine, giving it a road speed of up to 65 mph. The ACV is an amphibious vehicle, and in Marine Corps parlance that means being able to leave a ship at sea and swim to shore. The ACV can travel about 11.5 miles through water, using a pair of propellers mounted near the rear set of wheels to move the vehicle at speeds of up to 6 knots. The ACV is protected from heavy machine gun fire, artillery shrapnel, and is designed to protect passengers from improvised explosive devices. IEDs, placed in roads, direct their blast upwards into the thin belly armor of tanks and armored vehicles. Mine Resistant Armored Protection, or MRAP vehicles were designed to deal with the threat of roadside bombs, and the ACV incorporates MRAP-level protection. According to the Marines, it can also travel 18 miles on up to three blown-out tires. The Marines’ new armored vehicle is lightly armed, sporting only a remote-controlled .50 caliber machine gun—for now. Over the long term the ACV will incorporate a bigger gun in a turret. One possible candidate is the Kongsberg MCT-30 Protector unmanned turret. The MCT-30 is equipped with a 30-millimeter autocannon that can fire armor piercing, high explosive, and programmable air burst ammo, a 7.62-millimeter machine gun, and smoke dischargers. The MCT-30 is currently being fitted onto the U.S. Army’s Stryker Dragoon wheeled armored vehicles. Another alternative is from Israeli defense contractor Rafael, with its Samson 30 turret. Samson 30 has the added benefit of a built-in active protection system designed to shoot down incoming anti-tank missiles and rockets, and two Spike anti-tank missiles. The Amphibious Combat Vehicle is set to replace the early 1970s-era Assault Amphibious Vehicle. A long, caterpillar-looking vehicle that runs on tracks, the AAV was a veteran of the Cold War, Operation Desert Storm and the 2003 Invasion of Iraq. It was supposed to be replaced in the 2000s by yet another vehicle, the Expeditionary Fighting Vehicle. The boatlike EFV, with water jets that gave it a speed of almost 30 miles an hour at sea and ability to carry up to 17 Marines, was ultimately canceled in 2011 due to spiraling costs, reliability problems, and the inability of the vehicle to protect troops from the then-emerging IED threat. But the ACV has greater mobility over land than earlier vehicles, with a faster land speed, but its reliance on wheels instead of tracks has earned complaints it would be unable to traverse poor terrain. This is a trade-off every ground force makes—slower tracks and better cross-country performance or faster wheels and worse off-road capability? The Marines, with decades of experience with the LAV-25 light armored vehicle, have apparently come down hard in favor of wheels. There’s another problem with the ACV: the new vehicle is still not exactly what the Marine Corps needs. In the 1980s, the Marines pioneered what became known as maneuver warfare theory. Maneuver warfare placed an emphasis on speed and maneuverability over other tactics, to react faster than the enemy and force them into a series of dilemmas. Maneuver warfare pushed the Marines to reconsider amphibious warfare, placing airmobile assaults from helicopter on equal footing with the traditional “hit the beach” attack from ships and vehicles. Launched simultaneously, sea and air-based amphibious assaults would present the enemy with an practically unsolvable dilemma: defend the coastline or defend every patch of ground a helicopter could land on. Air assaults conducted by MV-22 Osprey and CH-53K King Stallion aircraft would ideally complement over-the-beach invasions. At the same time however, the proliferation of anti-ship missiles created a complication. Land-based anti-ship missiles could launch attacks against amphibious ships stuffed to the gills with sailors and Marines, placing them in danger. In 2006, an Israeli warship operating off the coast of Lebanon was hit by an anti-ship missile launched by the terrorist group Hezbollah. More recently, the HSV Swift, a catamaran transport chartered by the UAE military, was heavily damaged by a Houthi anti-ship missile, and in 2016 the U.S. Navy destroyer USS Mason fended off another Houthi missile attack. Thirty miles off a coastline, a warship has approximately three minutes to detect, track, and shoot down a subsonic anti-ship cruise missile barreling down upon it. At 10 miles, that becomes one minute. The U.S. Navy is very good at detecting, tracking, and shooting down these missiles, but operating close to shore to support traditional amphibious operations means less reaction time for missile defenders. This will likely force Navy ships to disgorge hovercraft, landing ships, and ACVs full of Marines farther from the coastline. This wouldn’t be a big problem for a vehicle like the cancelled Expeditionary Fighting Vehicle, which could cover 30 miles in an hour. The ACV, however, needs four or more hours to cover that distance, not including factors such as tide and current. The proliferation of land-based anti-ship missiles places ships like the USS San Antonio and USS Carter Hall, each loaded with hundreds of sailors and Marines, at risk of attack. Land-based anti-ship missiles have forced the Navy and Marines into a dilemma of their own: do they make airmobile assaults the main attack, and only roll ground vehicles ashore later, or do they still try to synchronize the attacks? Does the U.S. Navy accept the risk and sail closer to shore to cut the sea travel time for vehicles like the ACV? Future amphibious assaults, like those in the Navy and Marines’ storied past, will always involve managing risk. The Marines tried to buy a vehicle that solved their problems but it proved technically elusive. The service has wisely accepted to replace the four-to-five decade old AAVs with an affordable replacement that ticks off most, but not all of the requirements. To paraphrase a certain Army general, a good vehicle now is better than the perfect vehicle at some point in the future.